Description: Visions of a Valkyrie pours a hazy golden yellow hue with a bright white head that leaves very little lacing on the glass. The aroma is tropical fruit forward, predominantly pineapple, with backing hints of earthy hops showcasing a very juicy character. A juicy quality is certainly present in this beer, but there’s strong hop bitterness as well, something lacking in many hazy IPAs. The tropical flavors truly shine in the taste, with pineapple again leading the way within a mélange of tropical fruit flavors, imparting a juice box-like quality without becoming overly sweet. The balance within this beer is the standout – the hop bitterness balanced within the sweet malts creates a highly drinkable IPA. The medium body and moderate carbonation are standard for the style and help in the beer’s smooth, easy-drinking character. Fans of IPAs, New England-style IPAs, or otherwise will want to get their hands on this beer immediately. Food pairing: Visions of a Valkyrie brings a wide array of flavors that adds to many dishes and has enough heft to withstand even the heartiest of pairings. Try pairing with a light fruit forward salad topped with goat cheese and a light vinaigrette. While many beers find it difficult to not overpower a salad, Visions of a Valkyrie does it with flare and cleanses the palate perfectly. This is also a great beer to pair with lunch standards, such as a hoagie, burger and fries, or even fish and chips. The hearty quality of the beer handles the greasiest of fried foods (even those you’d find at a bowling alley, judging by the “Big Lebowski”-inspired artwork on the can) while allowing the food’s flavors to shine. Warmer weather is finally starting to move in, and that means backyard grills can start being used again! Visions of a Valkyrie goes great with BBQ chicken, grilled veggies, smoked salmon, hot dogs, and even veggie burgers. This is a true workhorse beer that goes perfectly with an array of foods. 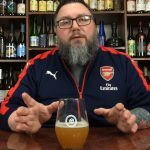 The final word: Burial Beer Company is a newcomer to the area, but it has been brewing some truly incredible beers for a number of years in North Carolina. Many craft beer devotees have become familiar with the brewery through beer trading or traveling. Thankfully, their beers are widely available throughout our area now and, even better, they have entered our market with some of their best beers, including Visions of a Valkyrie. There is a slight but growing backlash against some hazy-styled IPAs, but if it’s good, who cares how it looks? What makes this such a great beer is the wonderful balance of bitterness and sweetness. For those who remember the pre-hazy IPA days, IPA lovers used to chase high IBU beers with a strong bitter punch. Now it seems that drinkers have moved more towards juice and away from strong bittering, one of the major complaints against the style. However, when you experience a beer that possesses both qualities and in such a perfectly balanced manner, it is worth talking about. Where can I get it? Currently available in 16 oz. cans at: Sabatini’s Bottleshop & Bar (1925 Wyoming Ave., Exeter). Available on draft at: The Loading Dock Bar & Grill (1206 Harry P. O’Neill Hwy., Dunmore).